A silky skilled right-footer who started his AFL career playing in Western Sydney for the Giants. A creative and determined onballer, Treloar arrived at the Giants in 2011 as a 17-year-old underage recruit from the Dandenong Stingrays. After earning an AFL Rising Star nomination in his debut season, Treloar finished fifth in the Giants’ best and fairest count in 2013. It was a position he improved in his next two seasons at the expansion club, finishing fourth in 2014 and second in 2015. 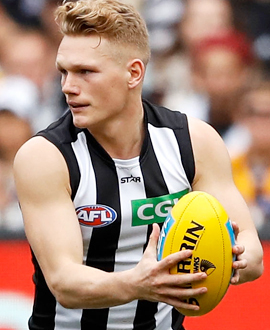 After four seasons in orange and charcoal, Treloar opted to return home to Victoria and enjoyed a sensational first season in the Collingwood midfield in 2016.